When I took over the company in September 2015, I was overwhelmed with what I didn’t know. Although I had been part of the business for almost 25 years, horse care fell fully to my late husband. In November of that year, I contracted the services of Glenn Stewart, an internationally recognized natural horsemanship trainer and certified farrier. I brought him to my farm where he initially spent three days with us going through our entire operation, encompassing everything from farm to town. One of his observations was that some of our horses were not being balanced properly in their bodies, via their feet. While I was open to the idea of a change in our shoeing program, I wanted to do so with careful thought and consideration. At that time, we were using rubber shoes with a steel core. We’d been using these shoes for years with the idea that while they could not be adjusted much to treat specific joint or hoof issues, they provided traction and cushion for the horse. I consulted further with Glenn and other experts: my learning grew and I started to explore options. Over the next six months Tally-Ho tried three different alternatives with no real success. In May 2016 we met Will Clinging, a well-respected certified journeyman farrier. Under Will’s lead, we decided to try two of our horses in steel shoes with borium for traction. He, and his team, custom made each shoe according to the individual horse’s need, ensuring his gait and body posture was correct (much like orthotics for humans). These horses were then closely monitored for both positive and negative changes in their biomechanics and gait. Both horses started moving better throughout their entire body, especially in their footfall placement which is key to maintaining healthy joints and muscles. To our surprise, they also showed improvements in their overall coordination and self-awareness. We were thrilled with the results (as were they)! Today, Will and his team provide regular hoof care to our entire herd, ensuring their feet are trimmed and shoes re-fit to give them support, protection and traction when working downtown. 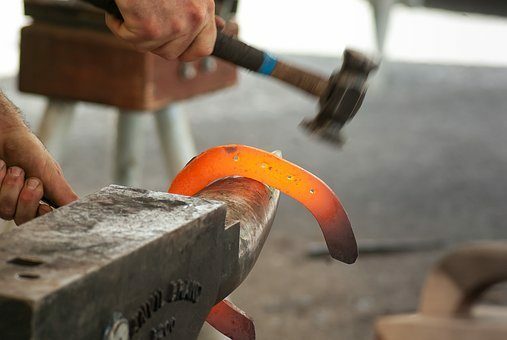 The formalized shoeing schedule ranges between 4 to 7 weeks, depending on seasonal conditions and if the horse has any special requirements that need to be addressed on an individual and frequent basis to prevent and treat lameness and unsoundness. In the winter months we only keep a handful of horses shod and the rest go barefoot while they are not working. WANTED: Loving family and career! Tally-Ho: Your Romance Specialists!